This weekend it was my friends little girls birthday and of course what more of an excuse do you need to make and eat cake! I wanted to do something simple due to limited time and ingredients I had available, but also with a little bit of ‘wow’ factor. So I got thinking… what do we all (well most of us) like best on our birthday?…..presents! This cake is like a present, all nicely wrapped on the outside with a surprise inside 🙂 Perfect! For the shape of the cake I used Lakelands large hemisphere cake tins which you can find here. I do recommend them, however I did find it hard for the cake to come out of the tin after baking even though I greased it well and put a small round cut of baking paper at the bottom. Anyone else used one of these and got any tips for getting the cake out after baking?! If so, please leave a comment! Also, this recipe does not make enough mixture to fill all the tin. It just makes over half (your only meant to fill the tins up 2/3s of the way anyway) but I still found the cake big enough for what I needed. 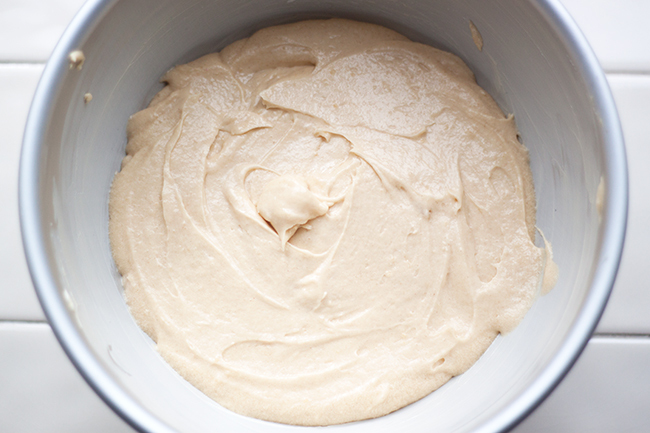 If you want to make more mixture I suggest using 4 Eggs and upping the flour, sugar & butter quantity to 200g. Smarties for the secret center! Hundreds & thousands for decoration. Grease your large hemisphere cake pan and line the very bottom with a little grease proof paper for extra help and preheat oven to 180oc. Lets make cake! 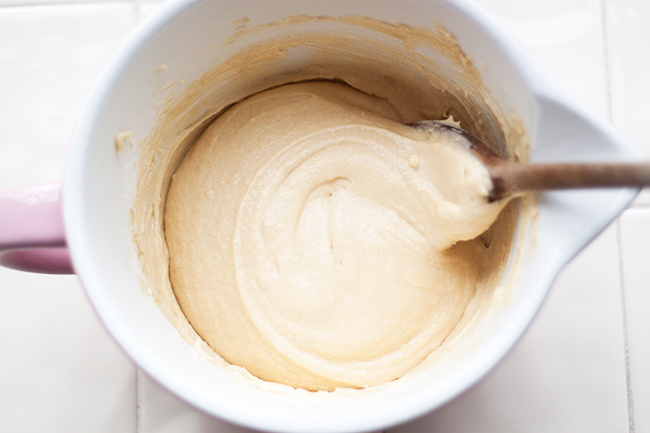 Start by creaming your butter and sugar together until light and fluffy. Add the eggs one at a time, adding a little flour each time. Once all the eggs are mixed in, add the rest of the flour and mix well. Add the vanilla extract and mix until everything is nicely blended in. 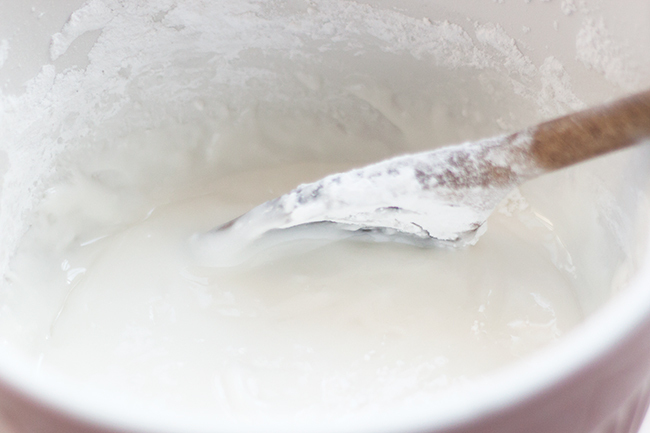 Pour your yummy cake mix in to your greased hemisphere bowl and cook for around 1 hour. 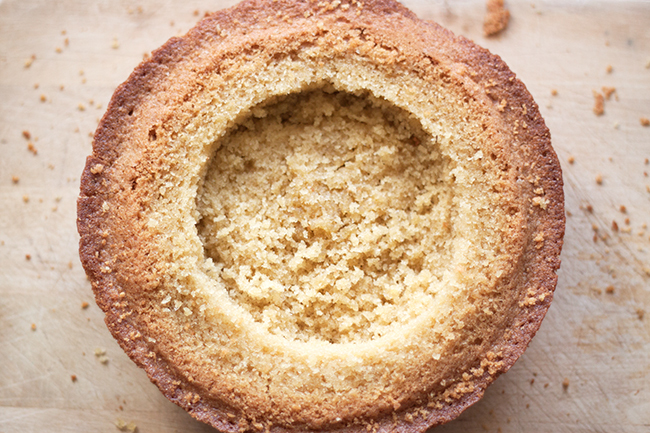 Once your cake is cooled, and out of the cake pan you will need to even the top out. So if your cake raised to a peak (even if it is only a slight peak I do suggest you still do this step) in the oven like mine just carefully slice off the top until even. Repeat this with the other cake. Next we need to make our secret hole for yummy smarties :). I just used my largest biscuit cutter and gently pressed and slightly twisted it in to the cake (going around an inch and half deep). Take the biscuit cutter out and gently spoon out the cake in the middle of the biscuit cutter mark to make a hole. Repeat this process with the other half of the cake. 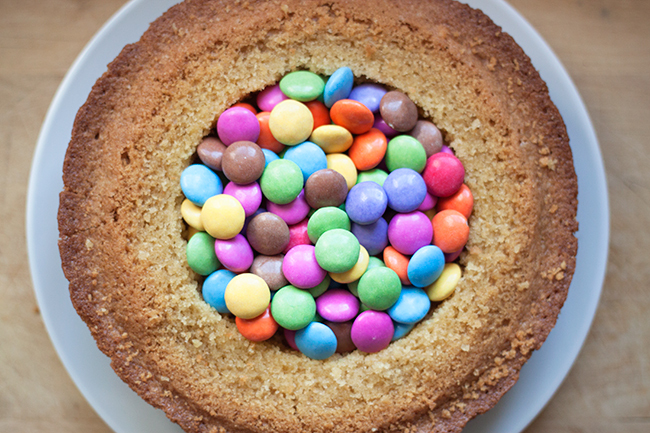 Fill one half of the cake with smarties :). 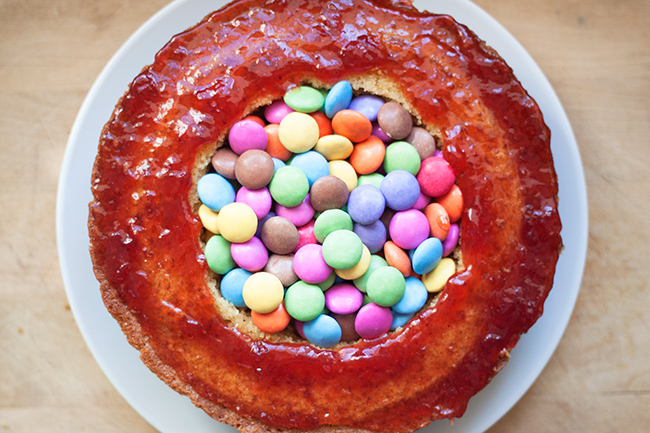 Next get some jam (I used a lovely strawberry flavour) and spread a thick layer around the outside of the hole with the smarties so the top half of the cake has something to stick to. 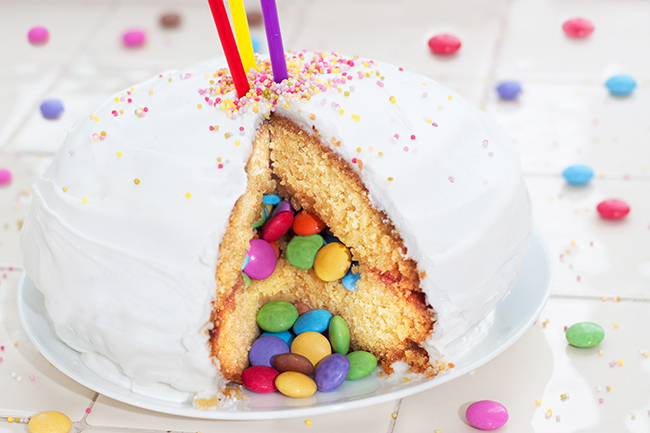 Stick the other half of the cake on top of the half with the smarties. Quickly, before the icing sets! Sprinkle some hundreds and thousands on! And there you have it. 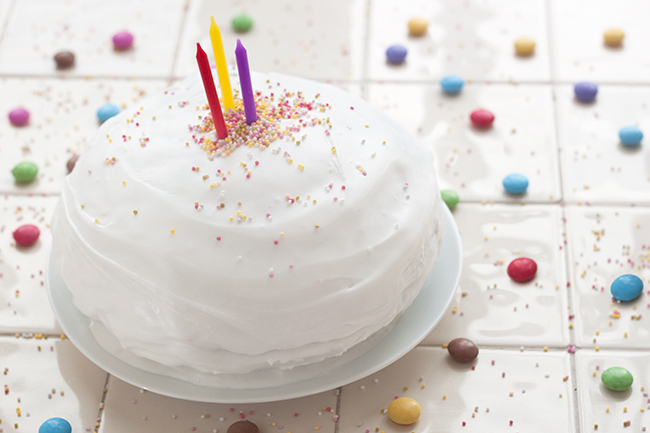 A very sweet iced, yummy surprise ‘smartie pants’ cake! Thank you! I cant wait to make it again! Love the look of this cake! I might try it next time I’m baking – I have the same Lakeland tin, and my cake is currently sat at home waiting to be turned out! I don’t know how to do that yet though…! I thought using royal icing was very yummy…super sweet! I will admit I did find it hard to get out of the tin even with a little grease proof paper! Just be careful, let me know if you find a trick to it! Brilliant! I will definitely have to get some. Nothing worse than when your cake sticks! Good cake, but i absolutely do not recommend using Royal Icing. It is just way too sweet! Use butter cream instead.